For a potential beneficiary in a nursing home, the application for Pension with the Aid and Attendance Allowance is very straightforward. The claimant simply has to complete either VA Form 21-527ez or VA 21-534ez and provide evidence of marriage (and a death certificate if applicable), the veterans DD214, and show VA that he or she is a patient in a nursing home via VA Form 21-0779. An award, including an aid and attendance allowance from VA, is almost always forthcoming without any additional requirements relating to a rating. Nursing home costs are also automatically annualized. Unfortunately, in most cases, Pension does not work well for paying the costs of a nursing home. This is because the amount of Pension income is rarely enough to cover the difference between the cost of the nursing home and the beneficiary's income. On the other hand, Medicaid will cover this difference in cost and in most cases Medicaid is a better alternative to Pension. Eligibility for Medicaid causes difficulty for those beneficiaries who also want to receive Pension income in a nursing home. For a single person, VA refuses to pay the full Pension benefit if that person is eligible for Medicaid and will only pay $90 a month towards nursing home costs. For a beneficiary with a spouse at home, the combination of Pension and Medicaid may not work due to Medicaid rules. Finally, if assets have to be gifted in order to qualify for Pension, this could make the potential Pension beneficiary ineligible for Medicaid. There are, however, circumstances where Pension fits very well for a beneficiary in a nursing home. One case would be where the nursing home patient has to go through a spend down in order to be eligible for Medicaid. Pension would also be beneficial where the nursing home patient is strictly private-pay or is private-pay awaiting an available Medicaid bed. And in some cases, Pension and Medicaid together might be a better alternative where there is a spouse at home. But each of these instances is specific to the individual circumstances. As easy and simple as the Pension application for a nursing home patient is, claimants should always seek the advice of a consultant who understands both Medicaid and the VA benefit. There are strategies that can be pursued to make Pension for nursing home patients work out in certain cases. But most people can't solve it on their own and it requires an expert to make the combination of Medicaid and Pension successful. If the veteran or veteran's surviving spouse is a patient in a nursing home, VA should automatically allow 12 months worth of nursing home costs to be applied as medical expenses. The patient will also automatically receive an aid and attendance allowance. The expenses applied are out-of-pocket costs after reimbursement. An annualized medical expense deduction can be allowed for unreimbursed nursing home fees even if the nursing home is not be licensed by the state to provide skilled or intermediate level care. The definition of a "nursing home" for purposes of the medical expense deduction is not the same as the definition of nursing home set out in 38 CFR 3.1(z). A nursing home for purposes of the medical expense deduction is any facility which provides extended term, inpatient medical care. A responsible official of the nursing home must sign a statement that the disabled claimant is a patient (as opposed to a resident) of the nursing home. We have included in our book a copy of a VA form that is used for this purpose. It is called " VA Form 21-0779 -- Request for Nursing Home Information in Connection with Claim for Aid and Attendance." A copy of the contract with the facility should also be included when submitting this form. Statements and evidence of payment must also be included. Canceled checks are not acceptable. Veterans in State Veterans Homes may apply their out-of-pocket costs for use of the home as a recurring prospective, medical expense deduction. Again, a statement from an official of the state home indicating the veteran is a patient, not a resident, should be submitted. In the case of a non-veteran spouse in a nursing home, where the veteran is still alive, the VA application 21-526 does not have a provision for disclosing the spouse receiving nursing home care. The spouse nursing home cost may be eligible for annualization of medical expenses. We recommend submitting a letter along with the certification from the nursing home that the spouse is a patient. We also suggest this letter request annualization or prospective treatment of the nursing home costs. We recommend checking the box indicating residency in a nursing home even though it is not for the veteran. This may confuse the Veterans Service Representative and even cause the application to come back, but it is a wasted application anyway if VA does not approve annualization of costs for the non-veteran spouse. A veteran in a nursing home will receive a rating for aid and attendance, but the non-veteran spouse of a living veteran will not. Of course, a death claim is different because the surviving spouse can receive a rating in that case. If VA allows annualization of nursing home costs for a non-veteran spouse of a living veteran, there will be no allowance for aid and attendance, and the Pension award will be much smaller. VA will not pay anything more than $90 a month if a single veteran or single surviving spouse is eligible for Medicaid covered nursing home care. State veterans homes are exempt from this ruling and those state homes that also accept Medicaid often end up with a surplus of income for the veteran. This is because Medicaid rules are not supposed to apply the allowance for aid and attendance or housebound to the cost of the facility. This extra $200-$300 a month allowance can be used to provide extra services or goods to the veteran. This money must be spent because if it is allowed to accumulate it will disqualify the beneficiary for Medicaid by pushing the allowable assets above $2,000. Accumulations may also affect the Pension benefit as well. Some state veterans homes report pooling this money to provide outings, special parties, fishing trips and so on for their residents. For purposes of income, VA will not count Medicaid payments as income for someone residing in a nursing home. However, Medicaid does consider VA Pension to be income that must be applied towards the cost of care. As mentioned above, Medicaid rules require excluding the allowance for aid and attendance or housebound as income. We have been told by some state veterans organizations that not all state Medicaid departments honor this rule and will count the allowance as income as well. Also, counting Pension income for those states that have an income test for Medicaid may create a problem for Medicaid eligibility. The most VA will pay to offset the cost of a nursing home is $2,230 a month for a couple, $1,881 a month for a single veteran or $1,209 a month for the single surviving spouse of a veteran. With nursing home costs ranging from $5,000-$7,000 a month, generally the VA benefit cannot cover the difference between the veteran household and the nursing home cost. In most cases there is a deficit. Medicaid will cover the actual difference between the Medicaid beneficiary's income and the cost of the nursing home. Medicaid is therefore a more viable benefit. For the reasons outlined above, many practitioners feel that trying to dovetail Medicaid with VA payments is not a useful exercise, and for those eligible for Medicaid, applying for Pension might be a waste of time. But there are situations where Medicaid may be available, and the Pension could be a valuable benefit as well. We offer an example of this further on in this article where a veteran, going through spend down to qualify for Medicaid, can provide more income that might be used for the spouse at home. Or Pension income can be used to lengthen the spend down process, and if the veteran dies while going through this process, valuable assets have been retained. Another use for the Pension benefit associated with nursing home care is where the single veteran or surviving spouse might be eligible for Medicaid, but there is a statewide waiting list for Medicaid beds. With the tightening of government purse strings, this situation is more likely to occur in the future. The Pension benefit allows the veteran, the surviving spouse or his or her family additional money to cover part of the cost of private pay until a Medicaid bed becomes available. For the beneficiary who is eligible for Medicaid and has dependents at home, sharing the Pension with Medicaid may be more useful than allowing Medicaid to pay the entire bill. Some state Medicaid programs encourage veterans with dependents to apply for Pension because it reduces Medicaid's liability for the cost. Those states should allow the aid and attendance allowance income to be retained by the veteran instead of applying it to the cost of care. The veteran should have a right under Medicaid rules to transfer this money to the spouse at home. Whether this affects minimum spousal income allowances, we do not know. For those spouses at home who do not need a minimum income allowance, presumably, this could represent extra income. This case illustrates the maximum benefit available to a single veteran with aid and attendance allowance. Residency in a nursing home automatically includes the aid and attendance allowance. The case was specifically designed to illustrate how Medicaid and veterans Pension could dovetail in providing more income. As a general rule, VA Pension does not work well with Medicaid unless there is a spend down as in this case or the nursing home has no Medicaid beds. If Medicaid is available, it is unlikely that VA Pension would be needed. *we highly recommend in cases such as this one that you contact a consultant who is proficient in both planning for VA benefits and in Medicaid planning. To try and understand what the best solution is by yourself is probably not possible without a thorough knowledge of both Medicaid and Pension. John is 84 years old and is a veteran of World War II. He did not serve in a combat zone. Mary, his wife, is 79 years old. John is a large man and has many medical problems. He takes a variety of expensive prescription drugs and has difficulty attending to his own needs without help. Mary is a frail woman and has difficulty helping him get out of bed, dress, bathe and move about. John also suffers from mild dementia and is often confused and Mary is concerned about leaving him alone. It is difficult for John to leave his home without using a walker and an aide to help him. John and Mary have a combined income of $2,400 a month which consists of Social Security for both, a small Pension and interest income. They have $66,000 in retirement savings and own a house and a car. They also have $120,000 available to them as a reverse mortgage equity line of credit if they choose to exercise this option. They are not required to pay anything other than the closing costs for this line of credit as long as one or both of them is alive and living in the home. In other words, there are no monthly loan payments. The potential line of credit will grow by earning 6% interest as well. John has a nasty fall and breaks his hip. After surgery, a hospital stay and a 30 day stay in a nursing home rehab facility, John's health deteriorates even further. Mary decides she cannot care for him at home and after being told by several assisted living facilities they cannot take him, she finds she must place John in a nursing home. Because of the differential in cost between the nursing home and their income, John will qualify for the improved Pension benefit with an aid and attendance allowance but in the state in which they live, he will also qualify for Medicaid. VA will not pay more than $2,230 a month in Pension that could be applied to John's nursing home cost. On the other hand, Medicaid will pay the much higher cost between the nursing home and John's income in lieu of the VA Pension benefit. Should Mary worry about applying for the Pension benefit knowing that Medicaid may cover the entire cost of the nursing home and allow a guaranteed spousal income as well? In this particular example Mary could come away with more money for her personal needs by using both the VA benefit and Medicaid. To understand why the combination of the two benefits is better we need to understand how Medicaid works. Suppose John and Mary do not have the VA benefit. Medicaid will not start paying for John's nursing home costs until he has spent his portion of the family assets down to less than $2,000. In the state in which he resides, John is responsible for spending $33,000 of their $66,000 in retirement savings. He can spend this on anything he wants but in this case the money needs to go towards the nursing home or he won't have a place to live. John's income is $1,800 a month and Mary's income is $600 a month. The cost of the nursing home is $5,000 a month. John must pay $3,200 a month out of his $33,000 of spend down money to the nursing home. After 10 months John will be below $2,000 and Medicaid will take over paying the $3,200 a month. Or Mary could take whatever income she needs, perhaps the full $2,400 a month, and let John spend the $33,000 for the nursing home in which case he would qualify for Medicaid in about 6 months. After Medicaid takes over, John's income must go towards the nursing home. In addition to $600 a month, Mary has her own $33,000 and she also has access to $120,000 in the reverse mortgage which if left in the line of credit will not count against John qualifying for Medicaid. On the other hand, income from the reverse mortgage could affect the veterans benefit so she will probably have to wait until John is on Medicaid. Medicaid will also not impoverish Mary completely and in the state where Mary resides, Medicaid will give her back $1,093 a month from John's income to bring her income to $1,693 a month. This is called the "community spouse monthly income allowance". But this is only available after John has spent down his $33,000 and qualifies for Medicaid. Mary has to live on something else in the meantime. Now let's suppose that Mary helps John apply for the VA Pension with aid and attendance and Medicaid at the same time. John must spend his share of the assets before he becomes eligible for Medicaid. As John goes through his spend down, VA will also provide additional money for this period of time. The benefit estimate is in the table below. John and Mary have an additional $2,230 a month to use for income or to apply to the nursing home while John is going through his spend down. Over the period of months where John is applying his spend down money, this is an additional $10,800 to $18,000 (depending on the spend down period) that they have that wouldn't be there without the VA benefit. After John becomes eligible for Medicaid, things get complicated. 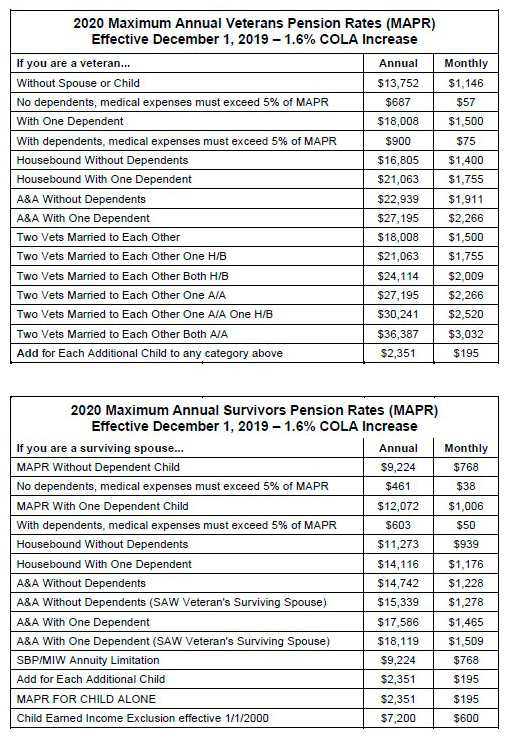 Medicaid does not count as income for VA purposes but VA Pension does count as income for Medicaid purposes. Whether the combination of the two benefits or Medicaid alone is better must be considered case-by-case. Such things to consider are the spousal minimum income allowance from Medicaid or whether Medicaid's payments on behalf of John will become part of a recovery effort by the state. If John were single, the solution would be simple. VA quits paying all of its benefits except for $90 a month when John becomes eligible for Medicaid. When John dies, Mary's lower income may qualify her for a death benefit Pension from the VA.